Kiddush Levana, the Sanctification of the Moon, is performed once a month, during the first part of the lunar cycle. Said outdoors at night, Kiddush Levana is a meaningful ritual highlighted by a Hebrew blessing, selections of Psalms and other prayers. It is often followed by joyous dancing. When to Do Kiddush Levana? Where to Say Kiddush Levana? 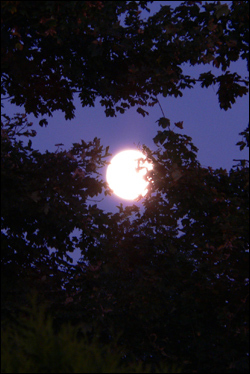 To bless the new moon at the proper time is like greeting the Divine Presence. 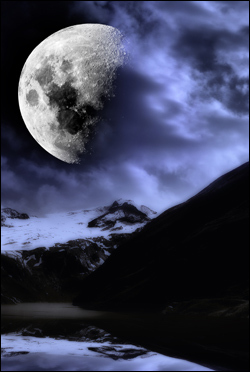 There is something mystical about the moon. Despite its secondary status as a luminary, people have always been fascinated by its silvery, luminous light and its precise cycle of waxing and waning. Indeed, the months of the Jewish calendar follow the phases of the moon. So, once a month, Jews open their prayerbooks to speak of the moon. 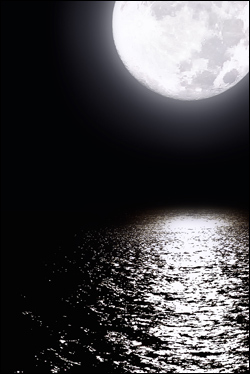 Upon seeing the soft, mellow light of the moon born again in the night sky, we recite a special blessing and verses of praise called the Sanctification of the Moon, or kiddush levana (Heb. קידוש לבנה). Here is the behind-the-scenes story. After lifting our heels three times,20 we then address the moon, so to speak: “Blessed is your Maker; blessed is He who formed you . . . Just as I leap toward you but cannot touch you, so may all my enemies be unable to touch me harmfully . . .” We emphasize these ideas by repeating this paragraph (and some of the subsequent stanzas) three times. Each time we begin, we lift ourselves to stand on our toes three times. We then recite two verses from the Song of Songs (2:8–9) that describe G‑d “looking through the windows, peering through the crevices,” just as the light of the moon does on a clear night. 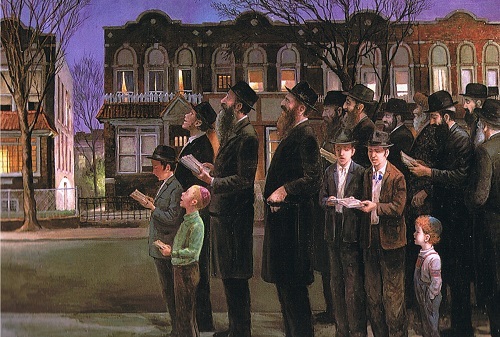 If there is a quorum of ten men, the mourner’s kaddish is recited. One of the underlying themes of the Sanctification of the Moon is our gratitude to G‑d for all that He has given us. Like the moon, the fate of the Jewish nation has waxed and waned throughout history. Yet we are still here to tell the tale. Sanctifying the moon on its reappearance is a way of renewing our trust in G‑d’s constant presence in our lives, and restoring our awareness that all He does is ultimately for our good. Commentary of Rabbi Jonah Gerondi on Rabbi Isaac Alfasi’s code, Berachot, end of ch. 4. See glosses of Rabbi Jacob Emden, the “Yaavetz,” to Talmud, Sanhedrin 42a. Glosses of Rabbi Moshe Isserles, the “Rema,” to Shulchan Aruch, Orach Chaim 426:1. Taz commentary (by Rabbi David Halevi) to Shulchan Aruch, ibid. 426:3. See Rabbi Jacob Emden, Siddur Yaavetz, introduction to kiddush levana. Magen Avraham commentary (by Rabbi Avraham Abele HaLevi) to Shulchan Aruch, ibid. 426:1. Rabbi Abraham David of Buczacz, Eishel Avraham ad loc. Ba’er Heitev commentary (by Rabbi Yehudah ben Shimon Ashkenazi, 1730–1770) to Shulchan Aruch, ibid. Shulchan Aruch, ibid. 426:4. See Taz, ibid. ; Rabbi Schneur Zalman of Liadi in his prayerbook. See Taz, ibid. ; glosses of Rabbi Shalom Dovber Schneersohn, the “Rebbe Rashab,” in Siddur Torah Ohr (Kehot, 1987); Rabbi Abraham David Lavut (1818–1890), Shaar Hakollel 33:3. Taz, ibid. 426:14. Of course if one is not feeling well, it is okay to say the blessing while one is looking at the moon from indoors. This is true of other blessings too (Magen Avraham, ibid.). But since this is usually done in the street, where it is more common to have this issue, it is noted here. Rema, ibid. 426:2. See Mishnah Berurah (by Rabbi Yisrael Meir Kagan, the “Chafetz Chaim”) 118:7. The source for the blessings is in the Talmud, Sanhedrin 42a. Talmud, Tractate Soferim 20:2; Shulchan Aruch, Orach Chaim 426:2. Rabbi Mordechai Jaffe (1530–1612), Levush Hachur 426:1. Rabbi Yisroel Friedman, Likkutei Maharich, vol. 2, end of Seder Rosh Chodesh. He quotes another reason: the author of this prayer is Joshua and it is said of him (Talmud, Bava Batra 75a) that “Joshua’s face is like the face of the moon.” Therefore we say this prayer here, since there is a connection between Joshua and the moon. Rema to Shulchan Aruch, Orach Chaim 426:2. The command to sanctify the New Moon in Egypt was not a command to say kiddush levanah. The mitzvah of sanctifying the moon is a Rabbinical obligation. The earliest textual source is from the Talmud (Sanhedrin 42a), which was written around 400 CE. However, the source of the obligation most probably traces back to the Men of the Great Assembly, who instituted all the blessings. That would put the source of the obligation between 500 and 200 BCE. Does it needs to be under the open sky, or it can be just seeing the moon from a window or balcony? The Rema (Shulchan Aruch Orach Chaim 426:4) writes that it should not be done under a roof (or a tree). The Mishna Berurah brings a few reasons for that custom and says that blessing the moon is like greeting the Divine Presence, and one should leave their house, just as one would do to greet a king. Sanctifying the moon, a big blob of dust in the middle of nothing, you might aswell sanctify everything and everyman on the planet since HaShem created those too and those men have waxed and waned through the ages...that includes yourselves...but wait, isnt that idolatry... "He alone is holy" I cannot believe I just read this, nothing and no one is worthy of worship apart from HaShem. You cant worship things he created because he created everything therefore everything he created would be deserving of the same worship.